This is one of the must-do easy hikes in the Gorge. From the Wahclella Falls Trailhead, start down Wahclella Falls Trail. The first part of the trail is a leisurely flat walk on a closed access road. At the end on the road is a small dam used by the Bonneville Fish Hatchery. The trail narrows to a single tread and just past the dam, there's a blind curve around a bluff. I almost hate to spoil the sudden surprise, but as you pass this curve, you'll be visually assaulted by Munra Falls. This waterfall might be a sideshow to the bigger falls upstream, but this one is so close to the trail that you might get wet as you cross the bridge at the base of the falls. At the head of the canyon, you'll pass through a bit of a grotto in full view of Wahclella Falls. Wahclella is one of the more interesting falls in the gorge. The most obvious portion is the lower drop, where the water drops from a hidden, narrow gorge 65 feet into a large open canyon. Above the lower falls is a semi-hidden upper falls in the main stream. You can see this 50 footer from the end of the trail loop. In the winter months, there's a third tier visible from further back, particularly on the lower level trail. This seasonal falls, sometimes called East Fork Falls, is taller than either of the main stream tiers. 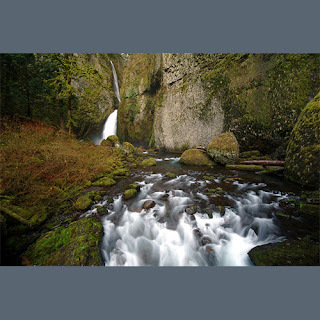 This oddity makes Wahclella Falls different heights at different times of the year. Past Wahclella Falls, the trail gains a bit of elevation and loops back toward the trailhead. There's a particularly good view of the 1973 landslide from a small bridge halfway back to the junction. When you reach the earlier trail junction, continue straight and head back to your car.